Hyundai i20 Boot Space, Size, Seats | What Car? 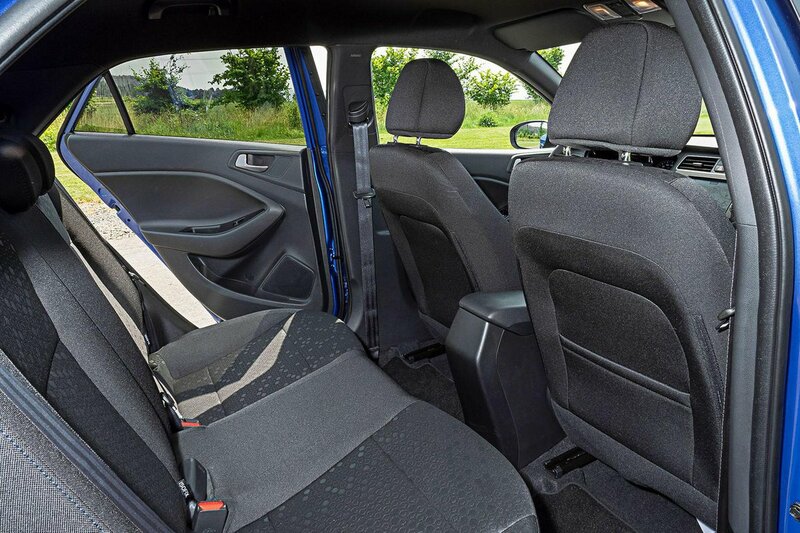 TThe i20 is one of the roomiest in the class, with enough leg and head room to accommodate tall drivers with ease. It has a noticeably wider interior than most rivals’, too. The door bins have a moulded section that holds a 1.0-litre bottle in place, plus two fixed cupholders behind the gearlever. You’ll be able to stow a portable sat-nav in the glovebox along with the handbook, and on SE trim and upwards, the glovebox can also be chilled, making it perfect for storing a sandwich or drink. From Premium Nav trim upwards, there is a central cubby that doubles up as an armrest and a phone dock. If you don’t have the phone dock, there’s a shallow cubby in front of the gearlever that’s an ideal storage space, given the proximity to the USB and 12V ports, although it’s not rubberised. Access is very good for this class, too, with broad door openings and a high roof. 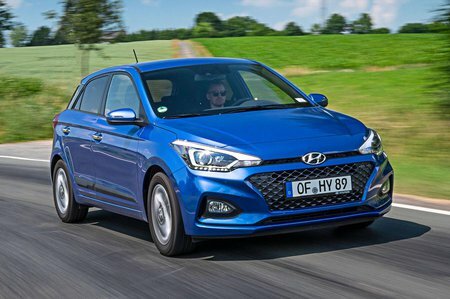 The five-door i20 is right up there with the Seat Ibiza and Volkswagen Polo in the class in terms of rear passenger space, with plenty of leg room and a particularly wide interior. Map pockets on the back of the front seats are standard, while the door bins are big enough to take a 750ml bottle. Access is very good, because the doors open quite wide and the high roof means you don’t have to duck too low to reach a child seat. The small car class isn’t known for its interior flexibility, but the i20 is one of the best of the bunch. The rear seats are split 60/40 and are easy to fold down to reveal a long load bay. Height adjustment isn’t available for the passenger seat, which has only four-way manual movement. 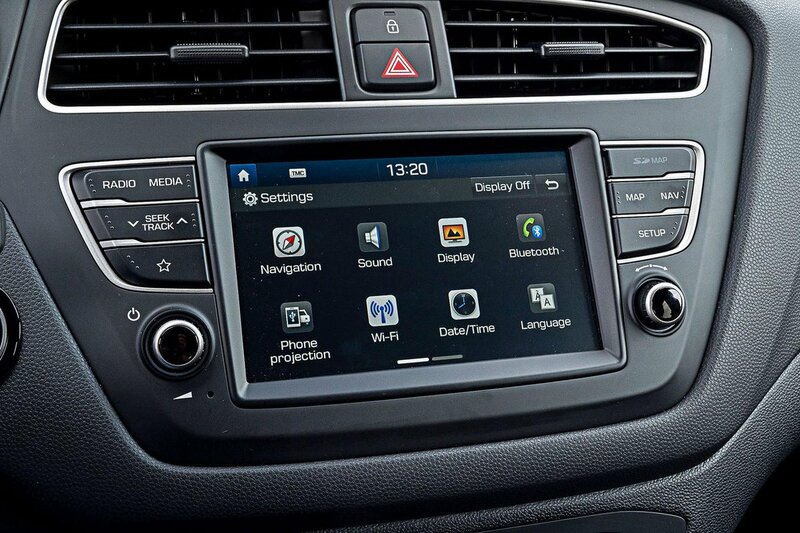 The i20’s boot is one of the biggest in the class. It’s broad and deep, well shaped, and has a wide opening, so it’ll take a buggy more easily than most rivals. From SE trim and upwards, a height-adjustable boot floor can create a hidden storage area. When the floor is raised, it sits flush with the folded rear seats for a smooth, uninterrupted load bay. Two bag hooks in the boot are also a practical touch. There is, however, a big drop down to the floor over the i20’s load lip.